Expectations: High, it’s Sam Fuller. 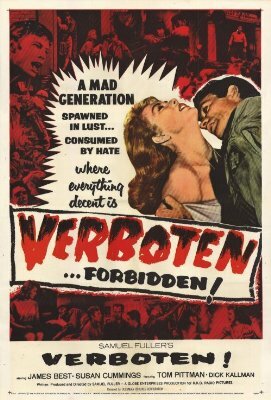 Verboten! is notable for a few reasons. It is Sam Fuller’s first World War II movie, it was the last picture produced by RKO and it’s a damn fine piece of 1950s cinema. Opening with a bang as all Fuller pictures do, we are thrust into the action as a pair of soldiers are under assault from some Germans hiding behind a jeep. After a well-placed grenade they take a moment’s rest under a road sign that reads Trinken Verboten!, but their rest is short as they have orders to enter the town of Rothbach and clear out a sniper nested there. Queue Beethoven’s Fifth and run for cover!